The Divers Guide platform can be set on country or region to search for dive spots or log files. You will find all the information you need to prepare your dive: Actual weatherinformation, tides, water temperature, visibility, spotted species and much more. What’s happening at Thousend Steps in Bonaire? What are the circumstances at Cova del Arcs in Spain? How is visibility at the Um El Faroud in Malta? So join us and get more out of your dives. What is our goal? The Divers Guide wants to help you to have a better experience and to discover more. That’s not an easy task. For a successful and inspiring dive you'ill need lots of knowledge and information. How to avoid hustle and bustle at a certain dive spot? How does a dive spot react on tides or on rainy days? When are chances best to spot that catfish or sturgeon? Nature doesn’t have an agenda. Only objective and especially actual information from fellow divers will enhance the chance of success! 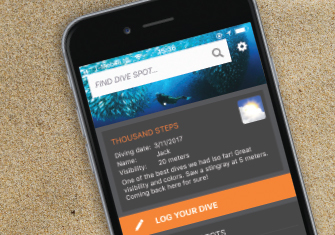 The Divers Guide platform also consists of an app. Download the app for free for Android or iOS. Take full advantage of the Diversguid platform by becoming a premium member. The premium membership will provide you with divemaps (mainly Holland and Belgium), 3D wreck animations, our tideplanner for diving in the Dutch Oosterschelde and much more. So get your premium code right now or take a subscription on the paper Divers Guide (in Dutch) that comes with a free premium code.